GANT Rugger for ACL & Co. | Handloom Madras | A Continuous Lean. by Michael Williams	Posted on March 15, 2010 March 16, 2010 —Filed Under: ACL & Co. There are certain fabrics that just can’t do any wrong by me, oxford cloth for one and of course tweed is up there, but for warmer months madras is the undeniable champion. Over the last several months I have been working with the folks at GANT on producing a special GANT Rugger “Handloom Hugger” Indian madras shirt – which launches in the ACL Shop today. We produced a small run (73 in total) of these co-labeled shirts to celebrate the 1973 birth of GANT’s Rugger collection and to celebrate our shared love of madras. Christopher Bastin, the GANT Rugger Creative Director, helped create a beautiful handloom madras specifically for ACL, and in the process created what I think is an instant classic. Christopher is someone that possesses an encyclopedic knowledge of all things Americana which made this project really enjoyable for me and our shared love of classic American menswear definitely helped in creating a good looking collaboration. 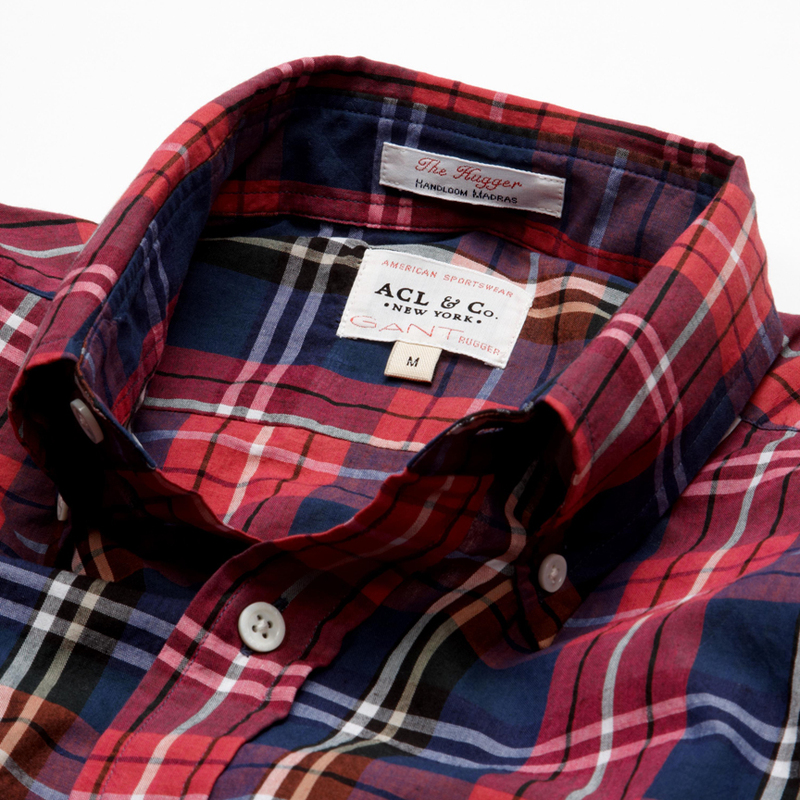 The GANT Rugger for ACL & Co. “Handloom Hugger” 100% cotton madras button-down shirt ($125) is now Sold out – but there is a small assortment at the GANT Fifth Avenue store on the second level. For the launch of the “Handloom Hugger” we will be giving away one shirt to a lucky winner. Follow @GantRugger for more information – details of the giveaway will be announced via the GANT Twitter feed at some point today. Where’s it made? I don’t see a country of origin on the main label. Indian madras, made in India. I believe it’s made in India..
Nice. Surprised there isn’t a flap pocket, though. Was that Gant’s choice? RCP beat me to the pocket flap question!? I saw a Gant shirt with a pocket flap at a Barney’s Co-op, so I’m thinking there’s a reason. What a terrific shirt! I hope to win it — if not i’m definitely buying. I follow your blog for the men in my family. 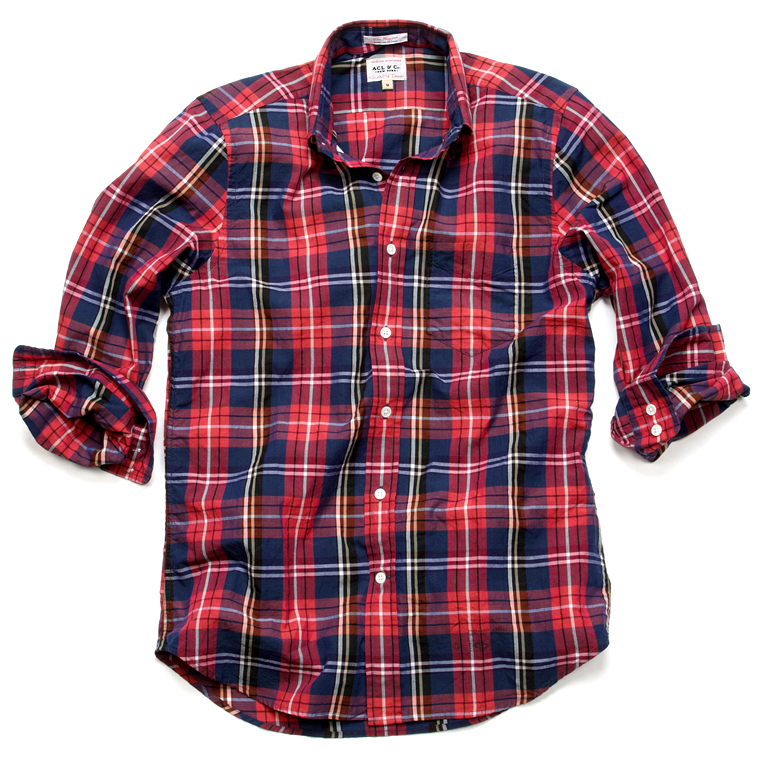 But speaking for me — do you know how scarce good plaid shirts are for women? Hint, hint. I went to Woolrich at your suggestion and bought the Buffalo Plaid version they make for women (not in wool, like the men’s, which I would have preferred); the cotton flannel has substance and the fit is decent, and really, for northern California, it is a better all-season choice. Such an amazing shirt. Pity it’s already sold out in my size, wish there was a run of 1973 instead. I see navy, black, white and red color scheme. Is there also yellow in it? That is one handsome shirt. they are all sold out already!??!?! damn the ides of march. got to this puppy too late! congrats, it’s really a beaute. Congratulations on a dynamite shirt! Hope this is a taste of things to come. Thanks to everyone for the support! All of the shirts have been sold. Awesome! I’m sorry I was too late to the party. Any chance for another run? Looks really nice , but colors and patterns looks more tartan plaid than madras to me , when you talk Indian madras you think more of pastels and springy colors , not sure pattern and colors really match with what a true madras shirt should be . any chance of another run? When I met my husband 16 years ago, he was wearing a Madras shirt, still love it (and him) to this day! just picked one up at the Gant store yesterday…lucky me I just happen to be visiting the city this week! The fit is perfect, and the fabric, it feels….amazing. I literally walked in the store, tried one on, and left wearing it. They have that same shirt at Uniqlo for $29.00. I would expect something more original. Brian â€” please send me a link to your clothing line so I can decide if you are original or not. i was like a kid in the candy store with this one, fits like a dream. i have been to uniqlo and can’t recall anything this great especially for $ 29.00. it may cost more and if you take care of it like one should it will 30+ years. my mistake, it will last 30+ years. You cannot even compare a Uniqlo shirt to something like this. I buy Uniqlo shirts because that’s what I can afford. On the flip side I have to usually put about $30 – $40 of tailoring into it to get it to fit right. From the reviews I have read, this seems like a nicely constructed, better fitting shirt than Uniqlo or H&M as most Gant pieces are. The differences between a $125 and a $29 are subtle but great. With that rant, well done, Mr. Williams. The ACL shop is looking mighty nice. I really do hope you do a suit one day. I’m sure you will kill it…even if I can’t afford one. with the success u had with this shirt…any plans of another run of this same shirt? A friend had given me a blue on blue madras shirt from Brooks Brothers about ten years ago. The cut was a bit baggy, but I’d been thinking about a shirt just like this and there it is. Nice colors, fabric and cut. Sold out? Is there nowhere else we can get it? i’m surprised no one has brought up the fact that this isn’t a made in america item.